The author of The First Circle, Cancer Ward and The Gulag Archipelago can truly be said to have altered Russia and thus the pattern of our times. This is as much a disturbing, haunting history of the twentieth century as it is a biography of a great novelist. Given the extraordinary language of Thomas and his novelistic gifts which he uses to render his story, this work will come to be regarded as one of the great biographies of recent decades. 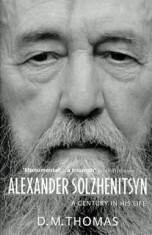 Particularly impressive is the vast cooperation of Solzhenitsyn’s first wife, Natalya, who has provided an astonishing portrait of her ex-husband’s life in Russia before his departure in 1974 from the then Soviet Union. The photographs used for the book come from her own collection as well.